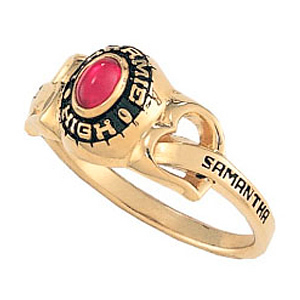 The girls' 10kt yellow gold Heartstrings class ring has a petite oval stone and two side engraving areas. Choose stone color and engravings. This high school class ring is handcrafted by ArtCarved. Ring top width: 9.0mm, palm width: 2.0mm. Enjoy ArtCarved's limited lifetime warranty. Import.